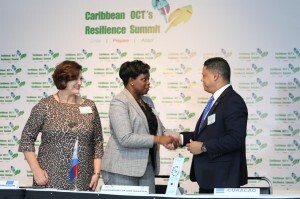 PHILLIPSBURG - The Caribbean OCT’s Resilience Summit hosted by Sint Maarten in collaboration with the European Union, took place in St. Maarten on October 25 this year. 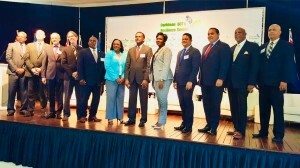 This first summit titled, Unite-Prepare-Adapt has marked the beginning of a Caribbean regional program which deals with three areas: Resilience, Marine Biodiversity and Sustainable Energy. During this summit, the 12 participating countries signed the EU program, which made 40 million euros available from the European Development Fund (EDF) to these Caribbean countries to use in the next 5 years to work on these three areas. The program relates to the development agenda of the European Union which concentrates on empowerment of communities. 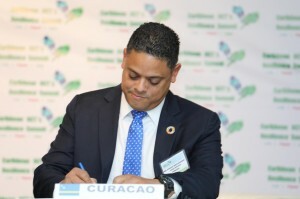 The Prime Minister of Curaçao Eugene Rhuggenaath representing the government of Curaçao signed the agreement with the EU to start implementing the program. The 12 countries that will benefit from the 40 million made available by the EU are Anguilla, Aruba, Bonaire, British Virgin islands, Cayman Islands, Curaçao, Montserrat, Saint-Barthélemy, Sint-Eustatius, Sint-Maarten and Turks and Caicos Islands. This amount is part of the 11 European Development Fund (EDF11). These funds are available to invest in ways to use energy more efficiently, sustainable energy; for the protection of the marine biodiversity, concentrating on the environment and the preservation of the ecosystem and its species; also the fortify resilience, thus be better prepared and resistant for the challenges caused by e.g. climate change, economic changes (regional and international) and social circumstances. 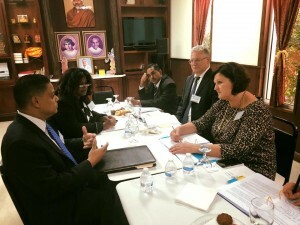 Topics such as, unify, prepare and adapt were central during the summit. Several leaders and professionals spoke about the above mentioned topics, such as World Bank and representatives of the implementation agency of the program Expertise France. Several pane discussions took place where the countries discussed the three topics of the summit. At the end the representatives concluded that each country has seen advances in each area but that together they can multiply their efforts, results and consequently increase the impact which is beneficial for the general interest. There are already talks about Curaçao being the host country for the next resilience summit which is planned for the year 2020.